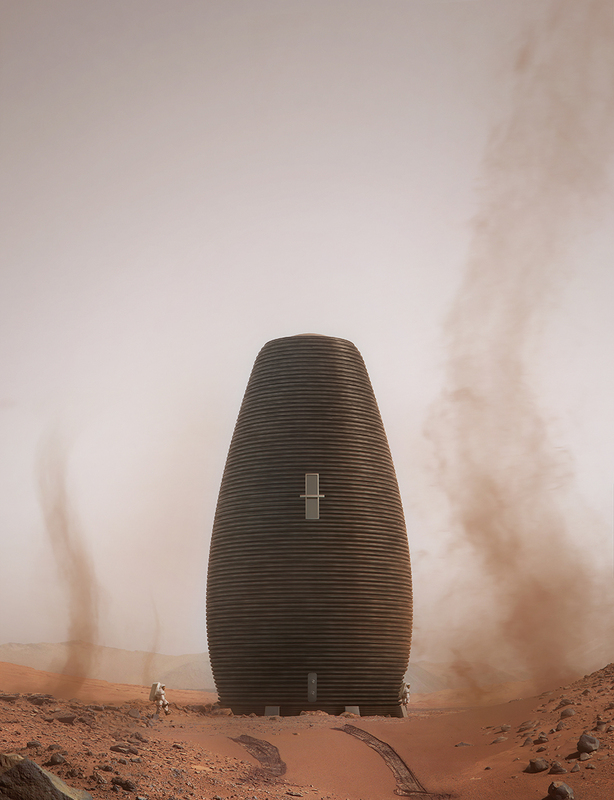 new york-based architecture and technology company AI spaceFactory presents marsha (MARS HAbitat), a 3D-printed visionary verticle housing on mars. the project marks a radical departure from previous habitat schemes typified by low-lying domes or buried structures. where structures on earth are designed primarily for gravity and wind, unique conditions on mars led to a structure optimized to handle internal atmospheric pressure and structural stresses: a vertical egg-like container with a minimal footprint. 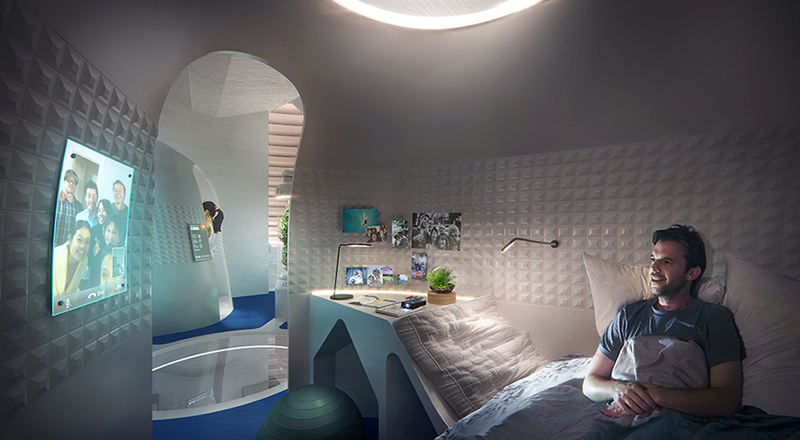 this innovation challenges the conventional image of ‘space age’ architecture by focusing on the creation of highly habitable spaces tuned to the demands of a mars mission. the project was awarded second prize within NASA’s competition and sponsored for future development. 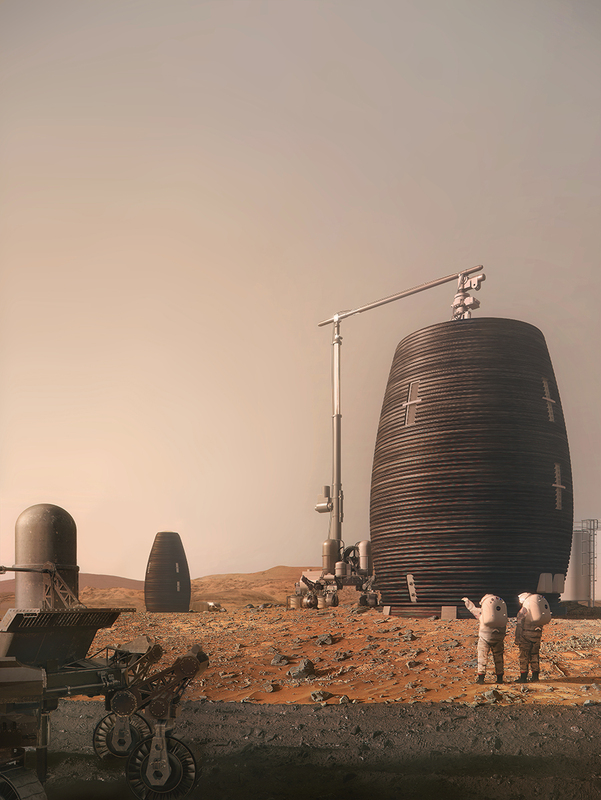 to realize the challenges of building on mars, AI spaceFactory’s solution relies on materials harvested from the martian surface, a technology known as ISRU (in-situ resource utilization). the team is formulating an innovative mixture of basalt fiber extracted from martian rock and renewable bioplastic (polylactic acid, or PLA) derived from plants grown on mars – eliminating the dependency on rockets to transport materials from earth. 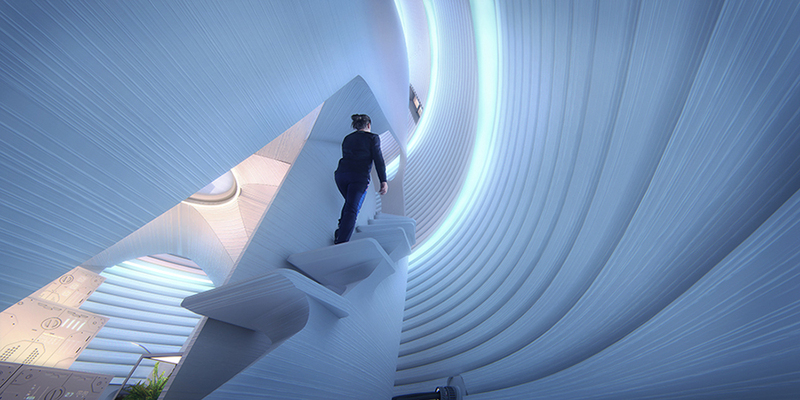 marsha stands vertically on the surface of mars — it is intended to advance the state of the art in autonomous 3D printing construction methods, materials technology, and architectural design. 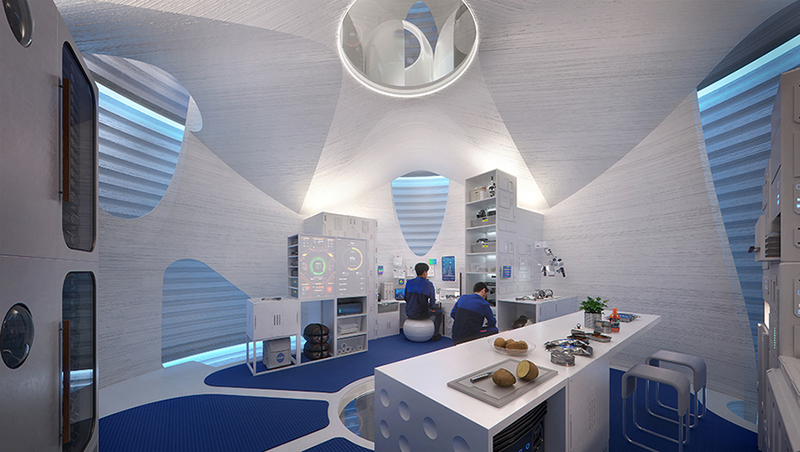 it pushes designers to develop human-centric habitats that can be constructed in-situ in preparation for the arrival of the first settlers on mars. 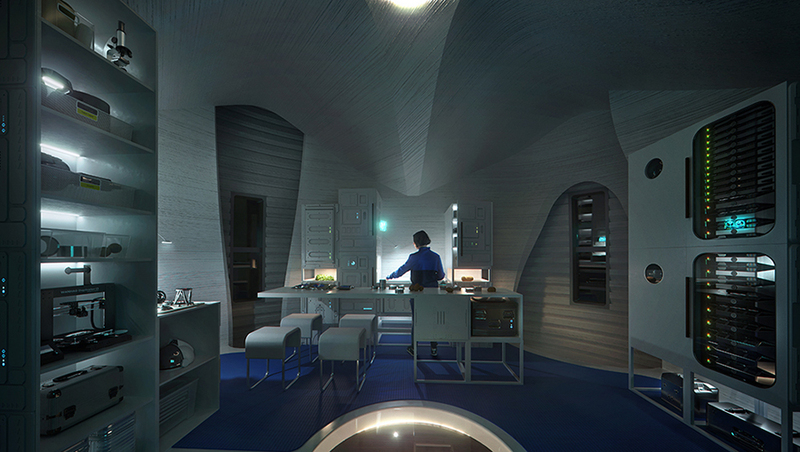 the result is a highly credible and evocative home with an alien yet familiar beauty. 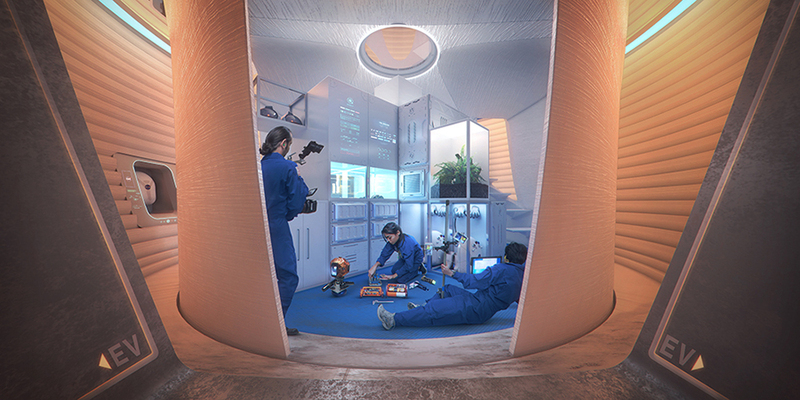 at ground level, the ‘garage’ is the interface with external systems and exploration activities with a supporting ‘wet lab’. just above is 34 square meters of joint dry lab and kitchen acting as the main hub. 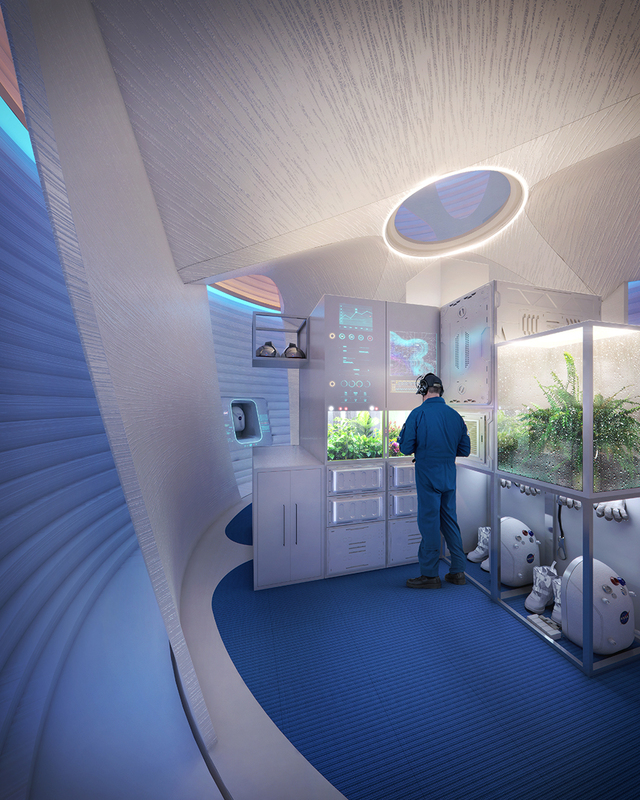 on the third level are the individual cabins, sanitation pod, and hydroponic garden. 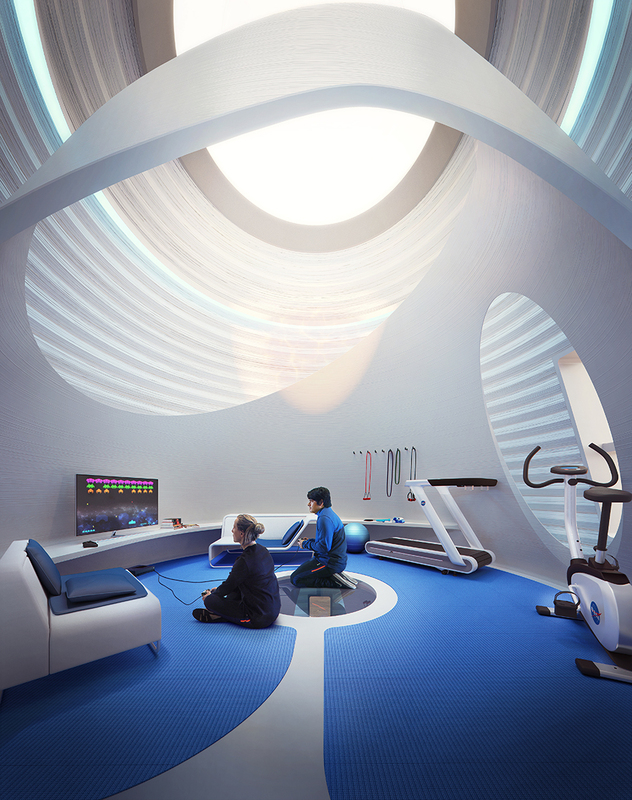 and at the top, the bright ‘skyroom’ is dedicated to informal recreational uses and exercise. each level has at least one window, which together cover the full 360° panorama. 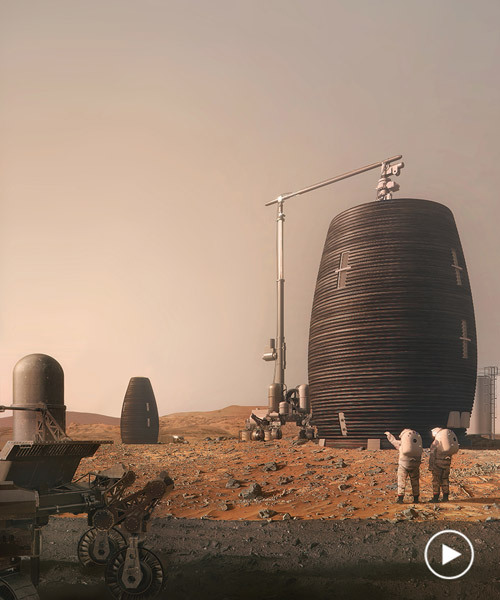 as in this alien environment, construction sequence and materials must be rethought entirely, the design team formulates a material specifically for 3D printing on mars: basalt fiber-reinforced polylactic acid (bf-PLA). PLA is a strong thermoplastic that is not only mission-recyclable like other plastics but mission-renewable using bioreactors fueled by mission waste. being mechanically comparable to high-performing petrochemical thermoplastics, PLA has countless applications as an expendable material through the full mission timeline. being a bioplastic, it has the added benefit of dual modes of in-situ manufacture: via the fermentation of carbohydrates by bacteria or via chemo-catalysis. on earth, most PLA is derived from polysaccharides produced by plants. the same could be carried out on a future mars settlement, where inevitable plant and other biological waste provide an opportunity to close material/metabolic loops. PLA also has the lowest coefficients of thermal expansion among plastics – crucial to achieving composite action with chopped basalt fiber, which is added for tensile strength (pressure-bearing capacity). basalt fiber, produced from local rock, is also among the most effective insulators known. I’d like to live there myself, can I get one for Earth? What we’re going to do is create the atmosphere. And we only have to move water to make windows and forests. Way to go!! !